Shortly before I received my copy of John Tranter’s latest collection, At the Florida, Mick Jagger turned fifty. Television marked the occasion with old Rolling Stones film clips and numerous minor musical celebrities emerged to describe how Jagger had influenced their own musical careers. Later, while glancing through Tranter’s biographical data, I realised that he too was celebrating his fiftieth birthday in 1993. So where were the “minor” Australian poets lining up to explain Tranter’s influence on their work, where was the TV news item, the magazine articles. I had in mind one of those celebratory volumes the English are so good at: A Collection of Poems dedicated to John Tranter on the Occasion of his Fiftieth Birthday. There is a certain symmetry here. Not only does 1993 mark Tranter’s fiftieth birthday, it also represents twenty-five years since 1968—a year that Tranter helped make a milestone in the development of contemporary Australian poetry. These factors, together with the publication of Tranter’s ninth collection of poetry and the Tranter-edited Martin Johnston: Selected Poetry and Prose, provide us with the opportunity to look back and perhaps begin a reappraisal of the new Australian poetry as it begins to take its place in Australia’s cultural history. The starting point for any study of contemporary Australian poetry over the last twenty-five years is the Tranter-edited anthology The New Australian Poetry (NAP) (Makar Press) in 1979. 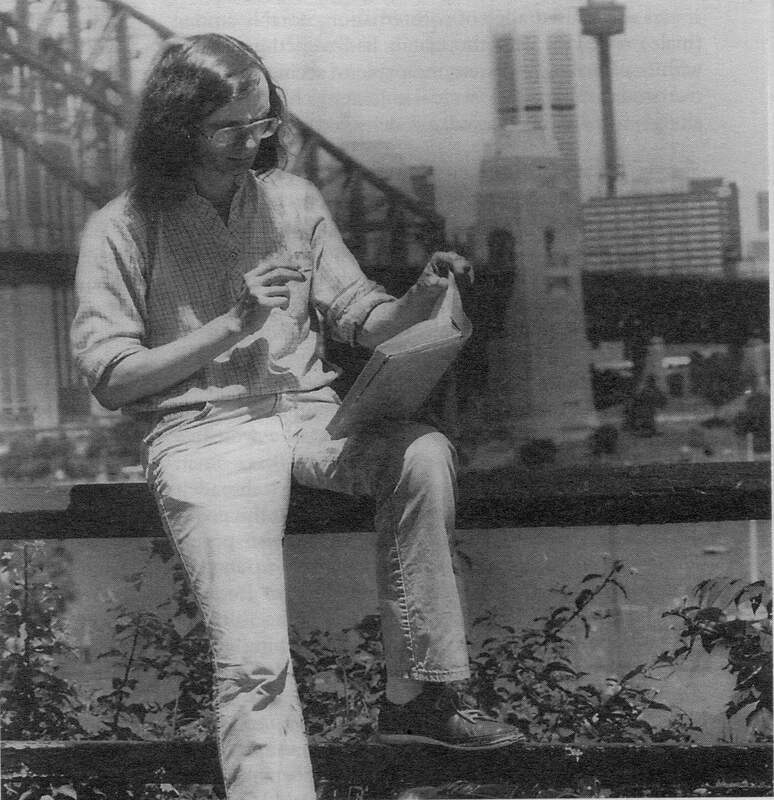 Tranter was not, of course, the first to recognise the major changes taking place in Australian poetry during the late ’60s and early ’70s. The label “New Poetry”, in its Australian context, probably owes much to the takeover in 1969 of the established Poetry Magazine by a group of young poets including Robert Adamson and Martin Johnston. Renamed New Poetry, its success over the next decade signalled the movement of the poets associated with the magazine into the literary mainstream. Five years later the term “New Australian Poetry” was also used by Kris Hemensley and Robert Kenny in the introduction to an anthology called Applestealers, edited by Robert Kenny and Colin Talbot (Outback Press 1974). In many respects Applestealers is as important an anthology as The New Australian Poetry. Although the two anthologies share many of the same poets, they are very different. The most important difference, I believe, lies in the five years that separated their publication. In 1974 there was an immediacy to the essays that Kris Hemensley and Robert Kenny contributed; they are a call to arms, a rallying cry against the “abdication of poets from poetry to careerism”(Kris Hemensley ‘The Beginnings—A note on La Mama’ Applestealers page 9). Whereas, by 1979, Tranter was looking back and documenting the movement. Although many of the poets were still writing, one senses in the introduction to The New Australian Poetry that Tranter was attempting to confirm the New Australian poetry’s place in Australia’s cultural history. It is ironic then, given that in his introduction Tranter identifies that one of the features of the new Australian poetry was its “freedom from the handcuffs of rhyme and the critical strictures of English departments”, that one of the great successes of The New Australian Poetry was the influence it had upon the teaching of Australian poetry in university and college English departments. This influence, I believe, was not unintentional. 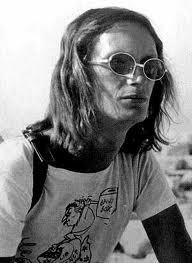 In his introduction to the anthology, and in a paper he gave to ‘The American Model Conference’ held at Macquarie University on 19791, Tranter carefully argued the importance of his “generation” and forcefully outlined the social, political and cultural factors which he believed helped propel a group of young poets to make a radical break with Australian poetic tradition. In this respect, then, Tranter’s anthology marks the end of the main period of dynamism of those poets he grouped together as the “Generation of ’68”. By 1979 many of the poets in The New Australian Poetry had become part of the poetry establishment—or rather they had created their own establishment. New Poetry magazine had become one of the most influential poetry magazines in the country and small presses like Island Press, Makar Press, Outback Press and Rigmarole of the Hours (among many others) had produced an extraordinary number of impressive titles. By the early ’80s, however, things had begun to change. The Australia Council’ and, in particular, The Literature Board were beginning to feel the effect of Fraser’s razor gangs and an economic recession made it even more difficult for poets to produce collections or for small presses to publish them. New Poetry magazine faltered, then folded, but by then many of the poets it had earlier championed were being published regularly in the mainstream literary journals. Given such a context, many poets would have been more than happy to look upon Tranter’s Generation of ’68 as a sort of lost golden age of contemporary, experimental/radical poetry. So then, who composed the Generation of 68? The easiest answer is those poets Tranter included in his anthology. But, as with every anthology, questions immediately arise as to why particular poets were left out. It is probably safest to look to Tranter’s own explanation. Tranter lists a number of factors which helped shape the generation: the baby-boomers of the postwar years who came of age in the late ’60s, advances in printing technology which made it cheaper and easier to publish magazines and books, and, that adjunct to imagination, drugs. But the most important influence was the new poetry of the USA which emerged in the late ’50s and early ’60s. While these factors may effectively include all the poets within The New Australian Poetry, it does remain a somewhat limiting definition if we are to attempt to understand the developments which took place in Australian poetry during the ’80s. Perhaps a better starting point is to identify those poets who were excluded from Tranter’s anthology. As Livio Dobrez has pointed out, it must be remembered that The New Australian Poetry “represents, after all, Tranter’s taste, his interpretation of the nature of the New Poetry, and one may well query the centrality of this”2. Of course the near absence of women in The New Australian Poetry has been a point of discussion ever since its publication. 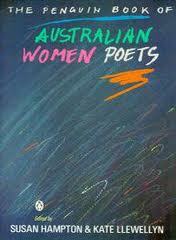 In fact both The New Australian Poetry and Applestealers each contain the work of only two women writers. Writers who I would have thought fitted Tranter’s description of a Generation of ’68 poet, such as Jennifer Rankin, Dorothy Porter, JS Harry, Pam Brown, Lee Cataldi and Kate Jennings, aren’t even mentioned. The Generation of ’68 has come to dominate discussion of Australian poetry over the last twenty-five years. But while the movement Tranter effectively analyses did make a profound break with tradition there were other poets who were also smashing their way through Australia’s poetic orthodoxy. Kate Jennings’ 1975 anthology Mother I’m Rooted had an enormous effect on Australian poetry in general and on Australian women poets in particular. Nine years later Susan Hampton and Kate Llewellyn, in their introduction to The Penguin Book of Australian Women Poets (1984), looked back over “fifteen well-known collections of Australian poetry since 1970” and found that on average women poets made up only seventeen percent of total contributors. They went on to claim “this may not be a problem of deliberate critical neglect, but a problem of consciousness—until recently most anthology editors, literary historians and critics have been male, and their gaze was unconsciously focused on other men”. Hampton and Llewellyn’s anthology sparked a debate which ran for years in the book pages of the weekend papers and the review pages of literary journals as anthologists attempted to justify the ratio of female to male poets, and conservative male writers pulled out their old rusty quality/excellence shield and attempted to take shelter behind it. Rather than view the Generation of ’68 as a coherent movement, it is, perhaps, more useful to see it as part of a larger cultural movement. 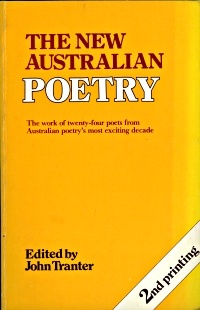 Such a stance would acknowledge that, while the influence of American poetry and the political upheavals of the ’60s gave an impetus to a group of young, predominantly male, poets to break from what was seen as an Australian poetic tradition, there also existed a more traditional poetry as represented by poets such as Les Murray and Geoffrey Lehmann. At the same time the ’60s was also the period that the women’s movement was reborn and it was only natural that women writers would quickly gain the self-confidence to broaden our notions of poetry even further. One could, at this point, also look at the development of gay and lesbian poetry during the mid-to-late ’70s which culminated in another influential anthology, Edge City on Two Different Plans, or the rapid growth of Aboriginal writing during the ’80s. Tranter himself seemed to be arguing something similar in the introduction to The Penguin Book of Modern Australian Poetry (1991) which he edited with Philip Mead. More ambitious than The New Australian Poetry, this anthology attempts to define “what is the ‘modern period'” and what poetry has been important to its development. In their introduction Tranter and Mead are, in effect, placing the Generation of ’68 writers in the sort of wider context which I have just outlined: “But our readings of the past keep changing. It seemed to us that modern Australian poetry needed to be looked at from a perspective that took in not only the issues of the ’60s, but those of the ’40s and the ’80s (and now the ’90s) as well”. Tranter and Mead go on to claim that “if the modern movement has a major theme, it must be the constant questioning of older ways of looking at things”. While such a definition can, of course, be applied to the writers in The New Australian Poetry it can equally be applied to Hampton and Llewellyn’s attack on the marginalisation of women poets or Kevin Gilbert’s reaffirmation of the strength of Aboriginal poetry in the face of two centuries of white cultural genocide. The roles of gender, race and ethnicity are crucial in any act of reading. While this (collection) doesn’t claim to be a feminist or a multicultural anthology, the selection from recent women’s and multicultural poetic writing has a strategic place in our understanding of modernity in Australian poetry… Poetry by women… has claimed a powerful role in postmodern developments in Australia over the last two decades. Mead and Tranter seem to be moving towards a view of contemporary Australian poetry which is more inclusive than Tranter’s New Australian Poetry, and they have indeed thrown a much larger net than Tranter did back in 1979. Their catch includes many of the poets who appeared in the Hampton/Llewellyn anthology and Kevin Gilbert’s Inside Black Australia (Penguin 1988). Interestingly it also includes poets such as Les Murray, Robert Gray and Geoffrey Lehmann who have commonly been regarded as the natural antithesis to the Generation of’68 poets. While the anthology has embraced the women’s writing movement and the diversity of multicultural and Aboriginal writing, there are, no doubt, those who can argue that The Penguin Book of Modern Australian Poetry excludes their poetry. On one level The Penguin Book of Modern Australian Poetry is refreshing because it appears to be retreating from the confrontationist approach which has marked poetry criticism in Australia for many years. 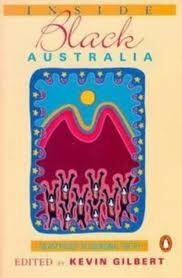 On a closer reading, however, the anthology can be seen to be building on the foundation of The New Australian Poetry. 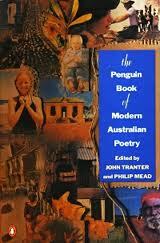 Tranter’s Generation poets emerge as central to the editor’s concept of “Modern Australian Poetry”. While the collection begins with Slessor, one is left with a feeling of the centrality of poets such as Tranter, Adamson, Johnston, Dransfield, Forbes and Duggan. These are, according to the anthology, the real groundbreakers, the poets who dragged Australian poetry into the modern world. They helped to created a climate in which women’s writing, and writing by non-Aiglo-Celtic poets could be critically accepted. The inclusion of poets such as Murray and Lehmann in such a context serves to place them in a hierarchy of modern Australian poetry where they can perhaps see the peak but have little hope of scaling it. 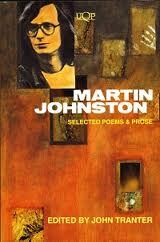 The futility of an approach which seeks to categorise poets, or to claim them for a particular movement, is clearly illustrated by the publication of Martin Johnston: Selected Poems and Prose, a posthumous collection edited by John Tranter. One of the strengths of the collection is that it brings together Johnston’s critical writing, journal entries and interviews, as well as his poetry, so that we begin to have some sense of the complexity of this remarkable writer. Introducing the writer and the work, Tranter refers to the unique place Johnston held among the poets of his generation, for while he was very clearly identified with the Generation of ’68 poets he did not fit easily into the new poetry pigeon hole. The son of authors George Johnston and Charmian Cliff, Martin had a childhood which was anything but conventional. He spent the first seven years of his life in England where his parents were working as journalists. They then moved to the Greek island of Hydra where George and Charmian attempted to make a living as fulltime writers. Following the success of the George’s autobiographical novel My Brother Jack the family moved back to Australia when Martin was seventeen. In many ways Australia remained a foreign country to him and he maintained a strong interest in Greek culture and politics for the rest of his life. how pitiful, how second hand, how weedy all our sub-O’Hara, sub-Ashbery, sub-Creeley and sub-Ginsberg; how ill fitting the borrowed clothes; how sadly comical the attempt to set up our rag-and-twig lay figures against the overwhelming weight of this century’s dominant body of English language verse. Johnston’s solution is not to ignore contemporary American poetry, which is precisely what some more conservative Australian poets did, rather it is “to set out to discover just what is being done, rather than pursuing our general custom of imitating the most facilely imitable… aspects of our models”. the empyrean gave way to the nibbling fish and the cold. the trout feed on seventeen dear dead ladies. take on meaning when we read Johnston’s notes: “Kyria Frossyni and her sixteen attendant ladies, drowned in the lake in 1801, for erotico-political reasons, by the then tyrant of Epirus, Byron’s good mate Ali Pasha. Ballads about this are still sung (and postcards sold).” A poem such as this is obviously far removed from the influence of the “groovier modern Americans”. of fruit-coloured clouds, a weak ambiguous vision. Mark Roberts is a Sydney critic currently undertaking post graduate study at the University of NSW. 1 See John Tranter ‘Anaesthetics: Some Notes on the New Australian Poetry’ in Joan Kirkbv (ed) The American Model: Influence and Independence in Australian Poetry Hale and Iremonger 1982. 2 Livio Dobrez Parnassus Mad Ward: Michael Dransfield and the New Australian Poetry UQP 1990.